We're exploring stem stitch again today, but this time the ways it can be worked a little differently. A lot of stitches have a standard version, and then several variations that change up the look or texture of the stitch. From left to right, we have standard stem stitch (for comparison), Portuguese stem stitch, whipped stem stitch, and raised stem stitch. 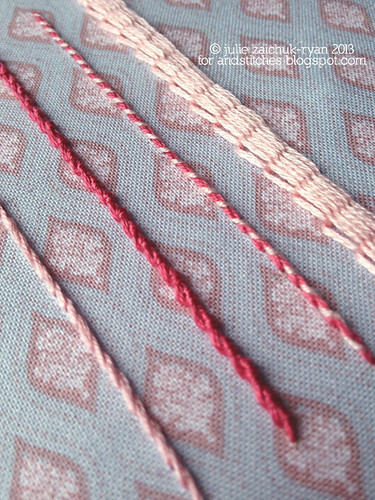 Portuguese stem stitch is made by wrapping each stitch twice before making the next. It creates a thick, knotted look that would work very well as a decorative border. Whipped stem stitch is just a line of regular stem stitch, wrapped with a contrast thread, giving the line a barber-pole effect. 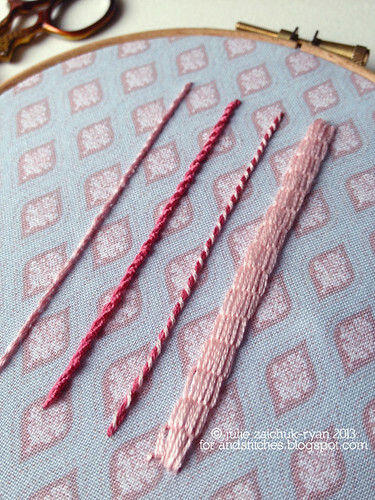 It looks very, very similar to whipped back stitch, whipped running stitch, and whipped chain stitch; I imagine they would be nearly interchangeable in most projects. Raised stem stitch was my favorite of the bunch, though I've never done it before and was a little intimidated! Worked over a ladder of parallel straight stitches, the stem stitches are actually wrapped around the straight stitches in long columns. This creates an incredible textured effect, with the stitches significantly raised from the surface of the fabric. This was a lot of fun to work, and would be awesome as a fill pattern in a very textured embroidery. Although stem stitch has never been my favorite, playing with these variations made me realize it has its merits. I hope you guys will give them a try sometime too!